Enjoy a creative dish of vegetables in this pretty shop with white walls. Mr. Hiroyuki Kaneko (金子裕之) the owner/chef has a qualification as a “junior vegetable sommelier’ and offers unique menus with his knowledge and creative ingenuity. When people taste these dishes with the flavorful ingredients, they can’t help but smile. Enjoy healthy and happy dining behind the alley! 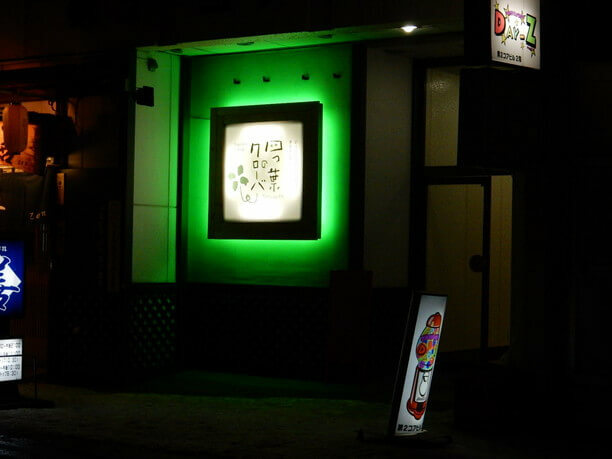 Yotsuba no clover is located behind the alley of the entertainment district of Asahikawa. As you enter into the basement of this retro building on a dimly lit street, a big wooden door awaits you. When opening the door you can feel the excitement of entering this building with its hideaway atmosphere. 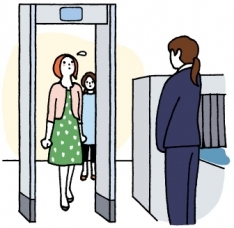 But once you enter you are welcomed into a bright space with white walls that is warm and inviting! Multi-color vegetables are lined up in the food case which is placed at the center of the shop. In addition to the classic onions and potatoes there are plenty of unusual colored and shaped vegetables that you do not usually see. Depending on the season there are vegetables from Date, Makkari, Ashibetsu and other power spots of the earth. Here you can taste delicious vegetable dishes that are nice to the body. This chef produces a variety of menus items with vegetables! 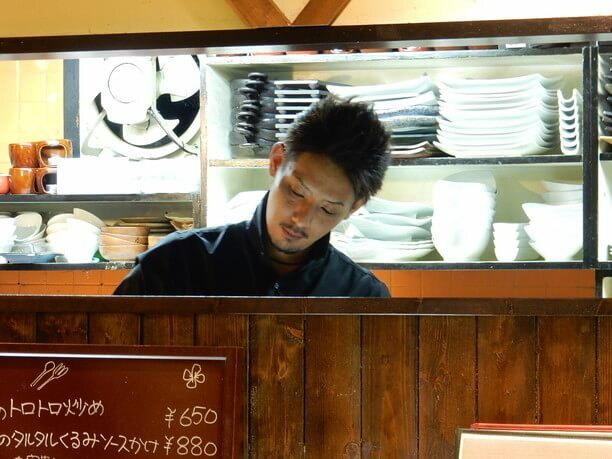 “Hiroyuki Kaneko the owner/chef prepares a number of vegetables in a wide variety of dishes. “I would like to convey the versatile taste of vegetables and I want to offer something that I can enjoy here,” he says with a smile. 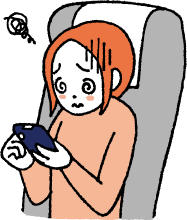 We are constantly striving to deepen our knowledge by exchanging information with suppliers in Asahikawa. We learn about how we can use all kinds of vegetables, their nutritional value, and preservation guidelines. ” Seiji Esashi (江刺　誠治),” is a vegetable supplier who brings rare vegetables and fruits. “He will bring them and teach me a variety of things about the vegetables I carefully select. They are all high-quality seasonal ingredient,” says the owner/chef. 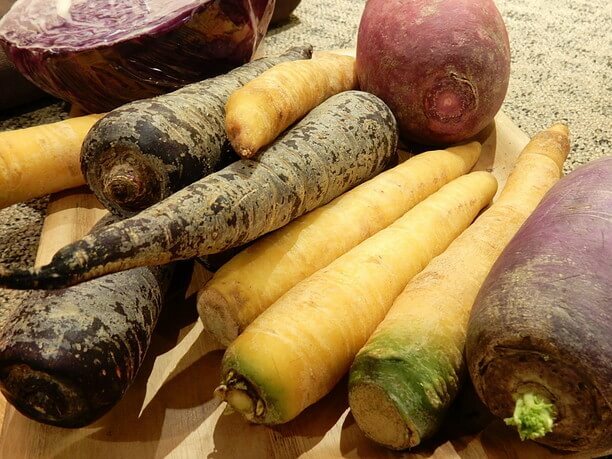 Using novel ingredients such as red radish, purple carrots, white eggplant, white vegetable romanesco etc. the chef makes use of their unusual appearance to turn them into an exciting and delightful dish. Enkoy these dishes that let you directly feel the taste of fresh and healthy vegetables! 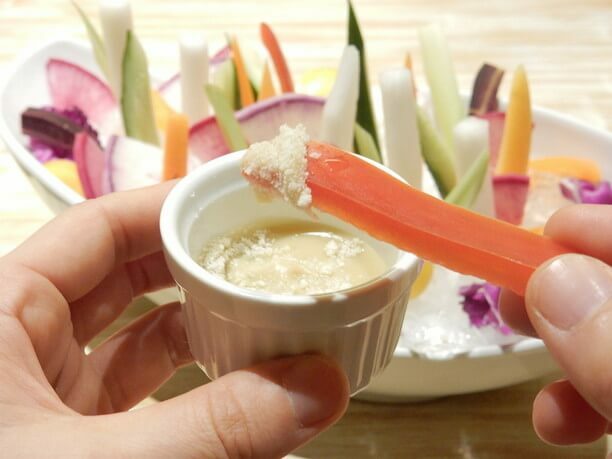 The most recommended menu item at this store are the vegetable sticks (1,480 yen). 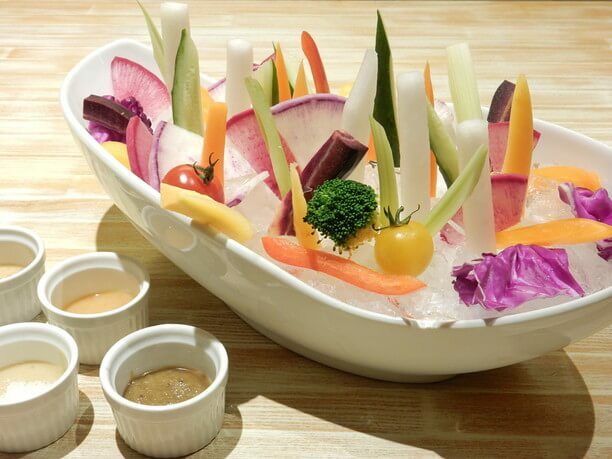 It is a dish with 12 to 13 kinds of seasonal vegetables that are fresh and well-colored! They get you feeling hungry just by being put out in front of you. The freshness and quality of the material will be conveyed by the crunchy sounds that you hear every time you bite into one of the vegetables. When eating, please add a homemade dip. There are 4 types to choose from, including an avocado dip and garlic sauce. All 4 types are served with a Fukuyama brewed miso, that has a mellow taste that gently complements the taste of vegetables. 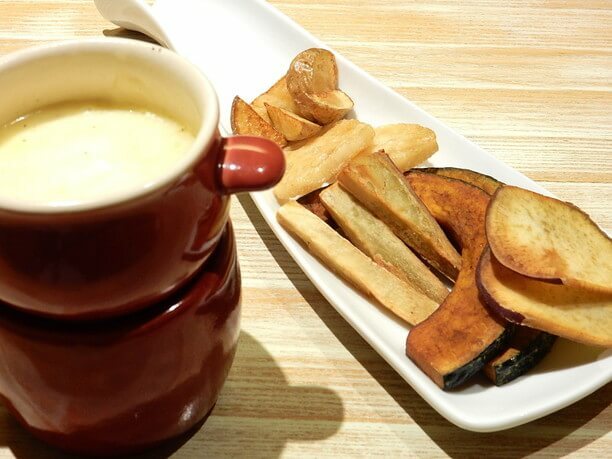 Another popular item is their cheese fondue (830 yen). It is served with 4 kinds root vegetables including lotus root and sweet potato with plenty of melted cheese. The unique flavor of the root vegetables make them perfectly compatible with the rich cheese. 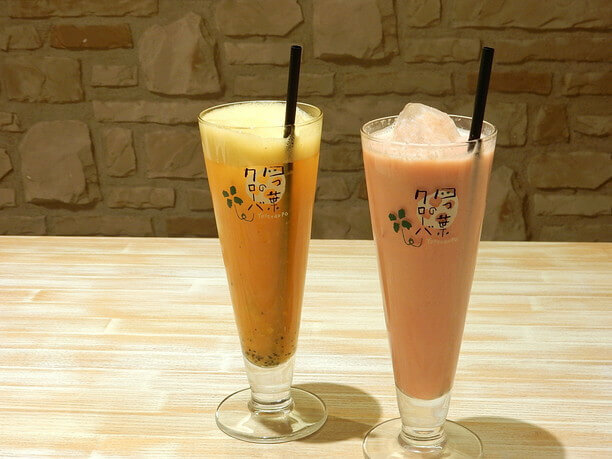 Enjoy vegetables in drinks and sweets! They also use the vegetables along with fresh fruits to make an assortment of delicious drinks. They have about 40 kinds of cocktails and other drinks that use raw vegetables and fruits. Very popular is the red vegetable cocktail (photo right · 550 yen) using a strawberry liqueur. By adding soy milk to red vegetables such as tomatoes and carrots, the beautifying effect of the vitamins and isoflavones on the skin is outstanding! Another popular cocktail of raw fruit (photo left: 600 yen) uses special vegetable juice and kiwi to create a natural sweet and sour taste. Furthermore, the original sweets can be made using vegetables. 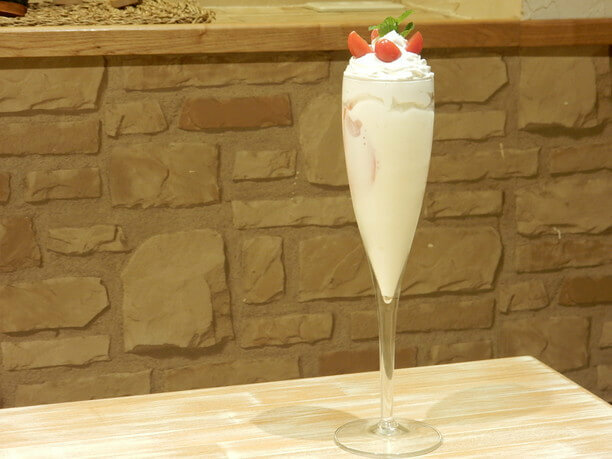 A specialty of the store is their tomato parfait (580 yen). They combine tomatoes with vanilla ice cream. The cool tomatoes surprisingly match the sweetness of ice cream and together create a special taste that can only be enjoyed here. In the summer, fresh vegetables from the chef’s farm are also included on the menu! In 2015, the 4th year since opening his restaurant, Chef Kaneko launched his own farm. 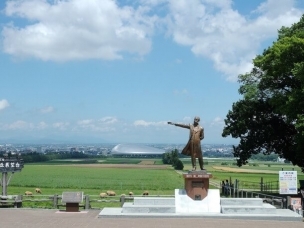 On his farm he named Yotsukuro farm, he grows about 10 kinds of vegetables such as purple cauliflower and maize pure white. In the summer, he is able to add to the menu an assortment of freshly picked vegetables. 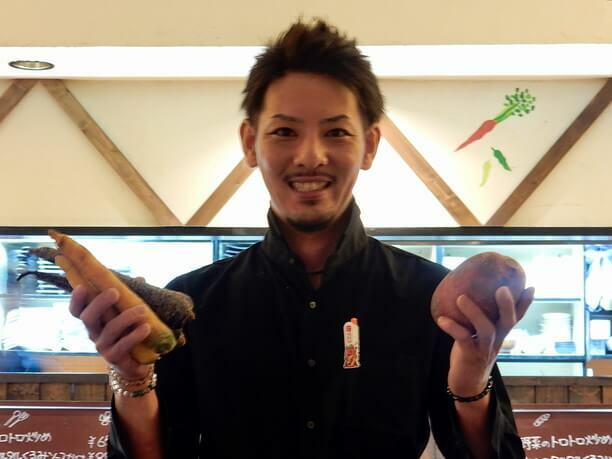 Although it keeps him busy, Chef Kaneko is really happy to be involved in everything from vegetable cultivation to cooking, to interacting with the customers. He plans in the future to increase the number of vegetables he cultivates little by little. Inside the shop, there is traditional seating that has separations between each table so you can enjoy the meal and quiet conversation. As you taste the healthy cuisine with plenty of nutrition, it will naturally make you smile! 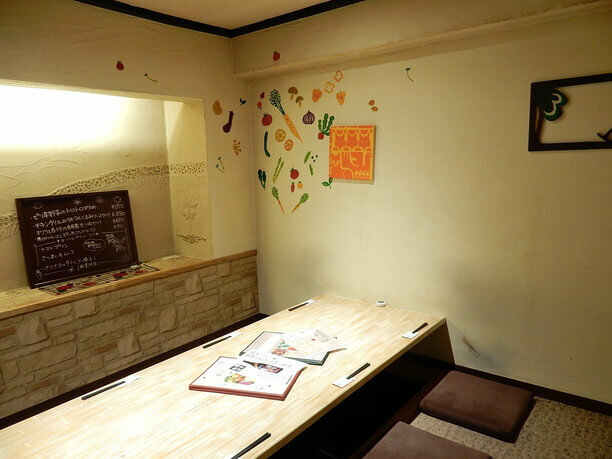 In addition to traditional “dig in” tables, table seats, and a couple of counter seats, there are also private rooms with fluffy sofas, which can be used according to the number of people and the mood. 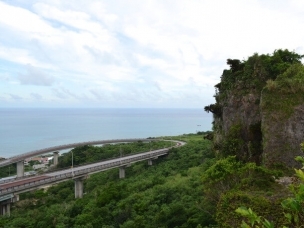 They have a full healthy menu, that is ideal for the health-conscious traveler. Since there are many dishes using rare varieties of vegetables. It is wise to ask the chef for suggestions so you can also enjoy trying new tastes. 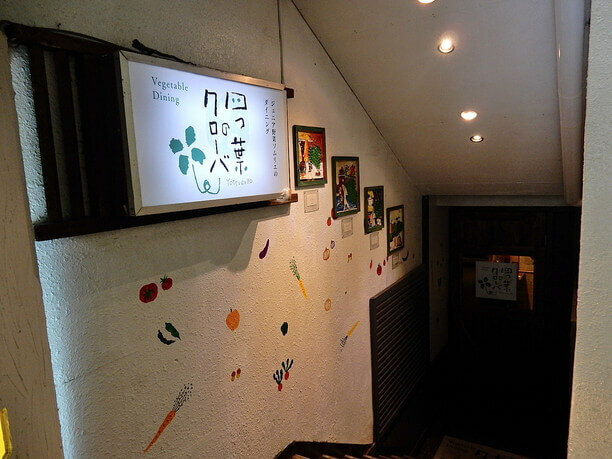 It is a pleasing shop for those who enjoy rich vegetable dishes. In the summer vegetables from the Yotsuro farm will also appear on the menu. Please listen to the story from the staff before placing an order, and enjoy eating cuisine made from the chef’s fresh farm produce! Soup Curry Kufuu uses a delicious combination of kelp and spices!